Rasdiono remembers when the sea was a good distance from his doorstep, down a hill. Back then he opened the cramped, gaily painted bayside shack he named the Blessed Bodega, where he and his family sell catfish heads, spiced eggs and fried chicken. It was strange, Rasdiono said. Year by year, the water crept closer. The hill gradually disappeared. Now the sea loomed high over the shop, just steps away, held back only by a leaky wall. 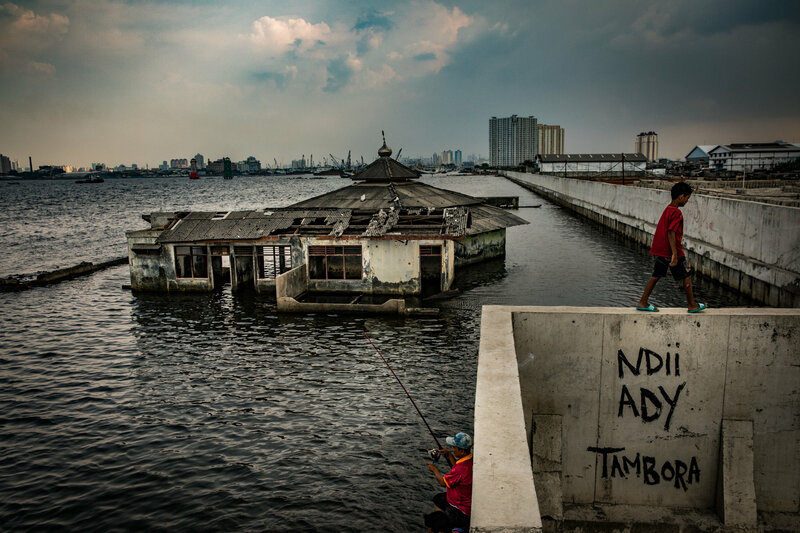 With climate change, the Java Sea is rising and weather here is becoming more extreme. Earlier this month another freakish storm briefly turned Jakarta’s streets into rivers and brought this vast area of nearly 30 million residents to a virtual halt.